Lower down this page you can see some groups that hire our hall - we have lots of activities on offer for all ages and many will keep you fit too, and near the bottom of the page are listed some of the regular groups using the hall - please contact them directly to enquire about joining in the fun. From January, Perform 4-7's children will unearth their hidden superhero powers in St Mary's Church Hall as they go on a top secret mission to save the world, on our Superheroes adventure. Global warming threatens the planet, so our brave superheroes have gathered together to cool things down. Their supercharged adventure will see them rock with Rocket Girl and sing along with brainy Brainio but will they make it to Partyland in time to restore order? Each term our 7-12's perform an exicting presentation, from January they are working on an adaptation of Jack and the Beanstalk, called Jack and the Wonderbeans. Join our hero Jack on his journey from Dullsville to the bright lights of Hollywood where he takes on mighty movie producer Hugo Giant. From the thrills of Bond-style spy adventure Doctor Moneybags to the madcap farmyard fantasy of The Golden Hen, this is a fast-paced and fun-packed show sure to bring out your child’s star qualities. Want to know more? Watch the video or book a free introductory class email Gemma Payne or call 020 7255 9120 or visit their website. Want to try some singing? 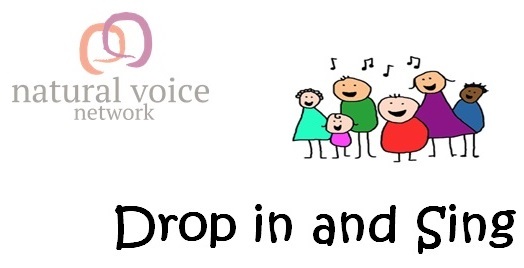 come and join 'Drop in and Sing' with Marlborough Community Choir - A relaxed, friendly approach to singing - no experience needed - no auditions - ability to read music not necessary - pop, folk, gospel & world music - all taught by ear. For more information please contact Kate Rowe or Vicky Sweeney 07593 833943. Are you fed up of counting points, following time consuming diet & exercise plans, and seeing no results? 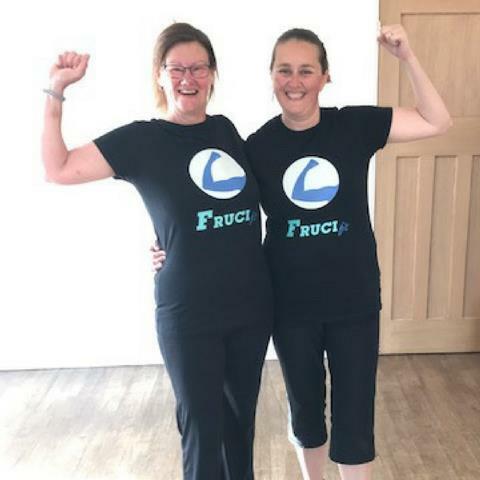 Matt Frucci helps Wiltshire Ladies Lose Weight, Get Fitter & Tone Up with his ‘SHIFT Personal Training and Nutrition System!“ - right here in St Marys Church Hall. Matt Fruci is Wiltshire's Ladies Health & Fat Loss Specialist. * Book your free trial at www.FruciFit.com, phone 07886 129305 or email Matt Frucci. * Come along, kickstart your weight loss, and have some fun doing it. * Look and feel great. 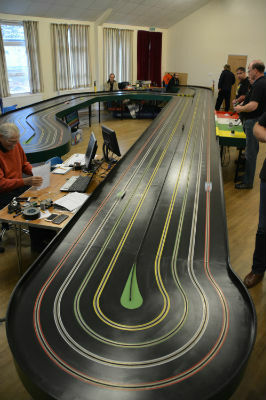 Maybe you fancy some fun racing around a giant Scalextric track that fills the hall? Contact Rob Lees if you would like more information and don't tell the kids! "I have been trying to sit down at my computer for a week and a half to say thank you so much for the use of the hall on the 31st. We had such a great time, well, it was utter chaos but the kids enjoyed it. My mother (a vicar's wife) and my aunt (a vicar) were both extremely jealous of your facilities at the hall. What a perfect place. It just couldn't have been easier or more convenient. I will try to book it for my daughter's birthday party in January shortly!! With thanks again for all your help, Imogen." 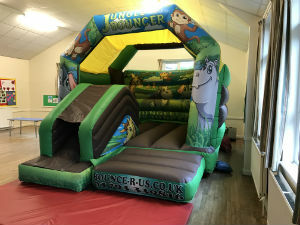 After a birthday party booking, Emma wrote, "Just a quick one to say a huge thank you for arranging the hire of the hall for us. It worked perfectly. The kitchen area and children size tables and chairs were perfect! We all had a great, if slightly chaotic, time with the bouncy castle, face painting and martial arts themed games! My daughter (who's 5th birthday it was) had a wonderful time and is still talking about it!" And following a conference about fungi, we received this feedback: "Many many thanks for your help and the use of St. Mary's Church Hall - it has been a wonderful venue for our conference and the feedback has been overwhelmingly good!" To request use of the hall, simply check availability on the live calendar lower down this page and book your slot now! 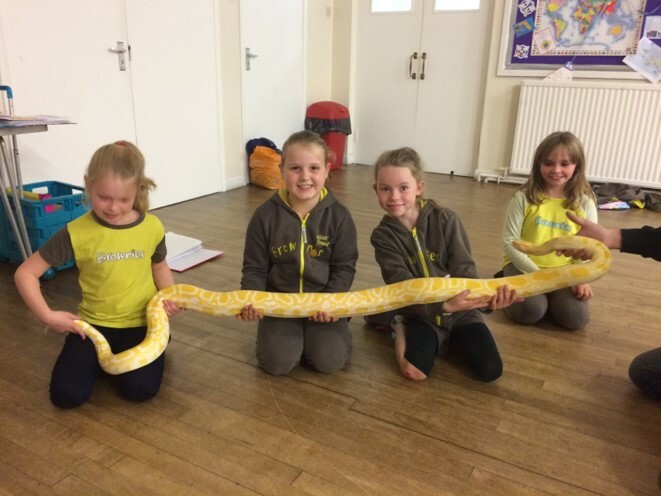 The primary purpose of St Mary’s Church Hall is to provide a venue for children to worship and learn on Sundays, and also for church gatherings. Having said this, the hall is nowadays a multi-purpose community hall and church usage is in the minority. There are a multitude of activities currently taking place in our hall - many for toddlers and children, so take a look at some of them at the bottom of this page and get involved! 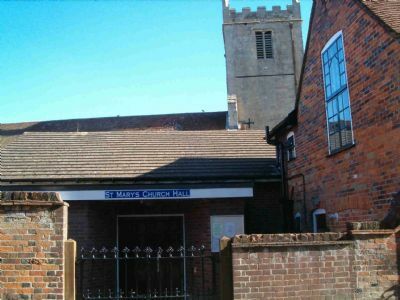 The church halls are run by a sub-committee of St Mary's PCC with the objective of running the halls as a self-sustaining asset for the benefit of both church and community. Hiring fees are set so that all the running and maintenance costs of the halls are covered, without the need for fund raising by the church, bearing in mind that the PCC has raised money to fund major improvements in the past. 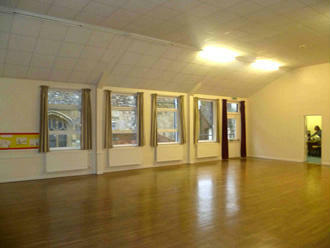 Main Hall: This is a lar ge hall available for hire on either a one off or on a regular basis. 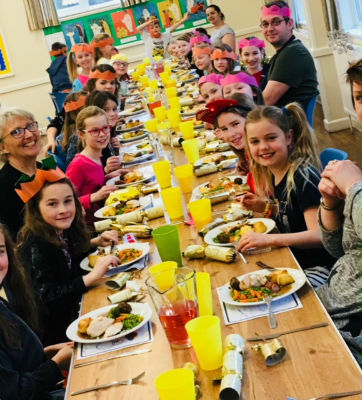 We have a wide range of users and groups using the hall, including Sunday School, Dance, Drama, Parents and Toddlers, Karate, Brownies, Yoga, Meetings, Disability and Support groups, Scalextric Club, Bridge Club, Birthday and Christening Parties, Wakes and Functions to name but a few. 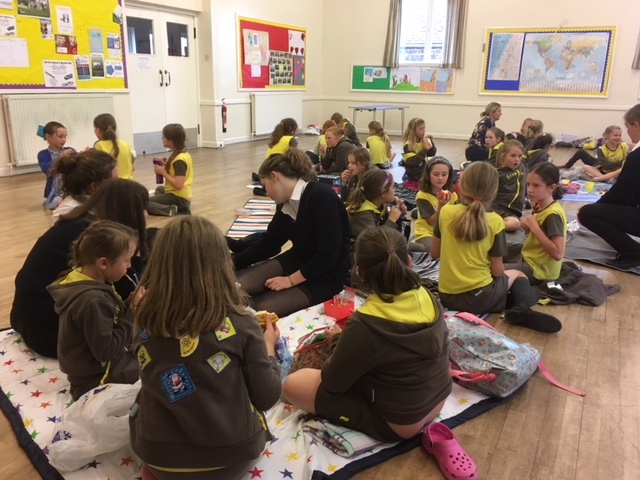 The 1st Marlborough Brownies have met in our hall for many decades and generations of girls have had a lot of fun here They make good use of our lovely new kitchen faclities and have even twinned our disabled toilet with one in Nepal and have also twinned the one in the church with another in Tanzania!!! If you would like to hire the hall, please use the form at the foot of this page to contact the Bookings Secretary for straight forward bookings, or click on the email link to discuss your requirements first. Before sending your request, please check the availability of the main hall on our Google Calendar below. Use the blue arrow to advance to the week you want, or change to month or agenda views. Any calendar booking information can also be printed if required. If an event is shown on the calendar at a time you want, unfortunately you will not be able to book that particular time slot, so no need to ask! However, you may still be in with a chance if the calendar entry is shown as a provisional booking (Prov). When contacting the Bookings Secretary, please state what you want to use the hall for (do check that it conforms to our Conditions of Hire first), the date and fully inclusive time required, your name, a phone contact and a postal address. Our Google Calendar can also be used to check that your paid bookings are listed correctly – please contact the Bookings Secretary if you notice any errors. A large clean wooden floor area approximately 12M x 9M which comfortably seats about 70 people but we have seen over 100 seated in there before now and up to 130 people standing. A light and airy feel with windows and curtains for that cosy feeling in the evenings. Electricity is included in the hire charge as is heating between October and April. 70 stackable adult sized chairs. A range of child sized tables and chairs. 6 Gopak large standard height tables, 70 cm high which is a comfortable height for eating from. They are 183cm long x 76 cm wide. 3 smaller Gopak tables, 120 cm x 60 cm and only 60 cm high. 6 even smaller Gopac tables 120 cm x 60 cm and only 50 cm high - bought for children to draw on. 8 square tables 2ft x 2ft (60 x 60 cm) with tubular steel frames. Again 70 cm high, somewhat old fashioned but can sit 4 people for tea and cake. 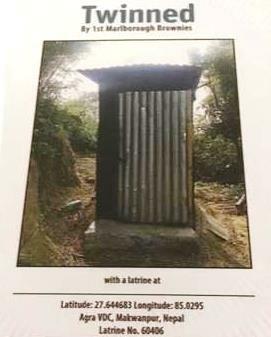 Toilets, including disabled access facilities. A kitchen available for the use of the hirer, equipped with an oven and hob, small fridge (under the worktop), urn, tea pot, about 70 plates, cups, saucers and some cutlery. Equipment storage space is provided for regular users of the hall. A small paved area outside the main hall can be used with evening and weekend bookings. 1. The person hiring the hall assumes full responsibility for the behaviour of the group that they book on behalf of and must ensure that all persons using the hall adhere to these conditions. The hall’s landlord insurance covers risk arising from the building and its fixtures and fittings, but we do not insure for any risks arising from the particular activities organised by hirers. We therefore expect hirers to take out suitable activity insurance where appropriate..
2. When invoiced, the hiring charge for your booking is to be paid in advance. For one off individual bookings your booking is provisional until payment is received in advance of your event. Regular users pay monthly in advance unless an exception has been agreed. 3. Hirers are requested to leave the hall tidy, free of rubbish and clean; In other words as they found it (or even better !) Large amounts of rubbish, for example, following a party, must be taken away by the hirer and disposed of elsewhere. Any chairs, tables or equipment used must be put away before you leave, stacking or storing it correctly as appropriate. We provide washing up liquid and hot water for washing up. You should bring with you items such as tea towels, kitchen roll, disposable cups and plates if you think you will need them. 4. Hirers are responsible for the security of the hall during their booking period. It is important that all windows and doors are secured or locked when you leave. Check that all kitchen appliances, taps and lights have been turned off. Hirers are responsible for turning out lights and locking up. 5. Hirers are expected to work co-operatively with, and with due consideration to, other hirers, particularly when there is a rapid change-round time between hirers. You must not enter the hall before your booked start time and must leave by the end of your booked session. This is very important when sessions are booked back to back and also to ensure that other hirers are not disturbed during their booking. 6. Any damage should be reported to the bookings secretary, or by calling/texting Martin Selby (number on noticeboard) so that it can be repaired promptly. 7. The Hall is not available for activities which conflict with Church of England ethics; in particular it will not be hired out for gambling and associated activities. 8. The person hiring the Church Hall is required to comply with the Parish Safeguarding Policies which can be accessed by the following links: Children's Policy and Vulnerable Adults Policy . A hard copy of these policies may be obtained from the Team Office on request, please follow this link for contact details. 9. Because of the residential nature of its environs, it will not be hired out for noisy activities, in particular teenage parties. 10. We do not hold a public licence to sell alcohol but will allow licence holders to bring small quantities of wines and beers onto the premises, provided that the primary purpose of the occasions is not the provision of alcoholic beverages. For occasional "one off" hire, the charges for the main hall are as shown below. The fully inclusive time booked must include time to set up and clear away. Regular weekly bookings may be charged at a lower, negotiable rate and discounts may be applied for all day hire. Please contact Bookings to obtain a quotation for your specific requirements. We have a strong preference for payments to be made directly by the hirer into our charity account at Lloyds Bank, either over the counter or by BACS. If however hirers choose to pay by cash or cheque, there will be an additional administration fee of £3.00. Loyalty discount offer - if you have used our hall before, you can quote your previous invoice number on the booking form below to receive 10% off of your next booking! We would be delighted if you would recommend us to a friend - just give them your old invoice number and they can have 10% off of their first booking too. 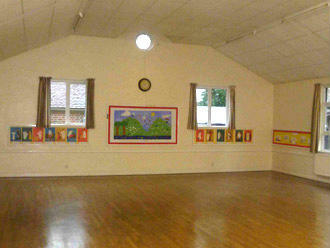 We have a wide variety of groups within the Marlborough community who meet in our halls and they welcome new members. The Google Calendar shows the days and times when they meet, and for your convenience some of the groups have provided their preferred contact details should you wish to find out more or join them. Please add any other comments here and we will respond as soon as possible. Please tick to confirm that you have read and agree to our Conditions of Hire.